Easyvoipcall - the smart way to make & receive phone calls. Free Video calls, free SMS, free voice calls! 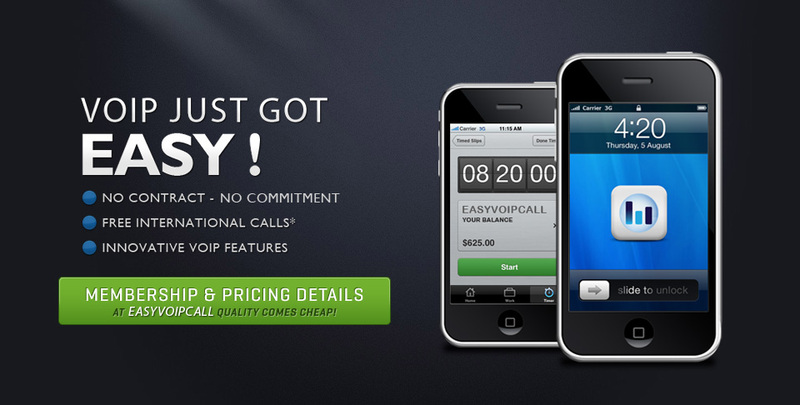 Easyvoipcall makes it cheaper and easier than ever before to get the most out of your phone. It's so easy to use and inexpensive, even the tech-nervous can handle the switch. Amazingly low rates for all destinations, over a clear & reliable phone service - plus a host of calling features. Our plans are designed to grow with your evolving business needs. We provide a large variety of features to those who want to start a retail VoIP business. Among them are: Call Shops, Calling Cards, DID's, SMS tools & others. Check voicemail via phone, web browser, or email! more. Never miss a call again, forward your incoming calls! more. Record and save any conversation on the fly! more. See who's calling you before you answer! more. Integrate Easyvoipcall with other popular web apps. Bring you and your friends, family and co-workers together find out more. Build your Phone System in Minutes! We offer a best-of-breed technology in each category of VoIP infrastructure included in our Hosted PBX offering and across our portfolio. We have a close working relationship with the manufacturers of all of the technology we support. As important, we have extensive production experience on their systems. more. Easyvoipcall's platform has receiced several awards during the years.